In July 1403 the powerful Percy family rebelled against Henry IV and allied themselves with the Welsh freedom fighter Owain Glyndŵr. 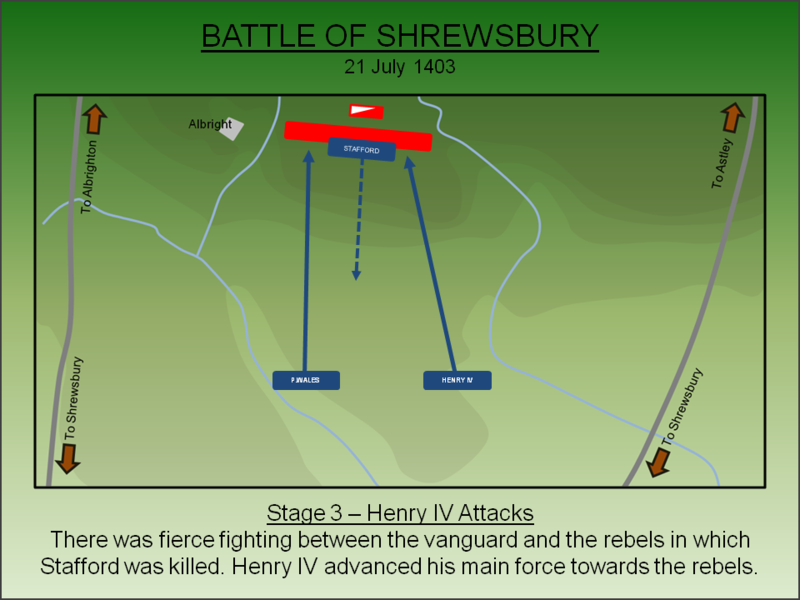 As the two rebel forces attempted to rendezvous with each other, the King cornered Sir Henry 'Hotspur' Percy and, at the Battle of Shrewsbury (1403), crushed the English element of the rebellion. Richard II came to the throne in 1377 but his reign was blighted by failure in the Hundred Years War as well as social and economic issues caused by the Black Death. On top of this Richard had alienated many of his key magnates. None more so than the heir to the vast Lancastrian inheritance - Henry Bolingbroke, Earl of Derby - whom the King had exiled in 1397. When Bolingbroke's father, John of Gaunt, died in 1399 the King seized his estates. Exploiting Richard's absence on campaign in Ireland, Henry illegally returned from exile nominally to reclaim his lands. However, when he found the King was deeply unpopular, he changed his objective and sought to seize the throne. One of the key magnates that supported him was Henry Percy, Earl of Northumberland who felt his power had become fettered under Richard II. After hearing of the return of Bolingbroke, Richard returned from Ireland. He landed in Wales and made for Conwy Castle where he met with the Earl of Northumberland who persuaded him to leave the safety of that fortress. Once the King did so he was captured and taken to Flint Castle where he was compelled to abdicate. The former King was imprisoned at Pontefract Castle where he was later murdered, probably by starvation. Bolingbroke was crowned Henry IV in October 1399 but almost immediately the relationship with the Percy family came under strain. The Earl of Northumberland had hoped that Henry would become his pawn and they would profit accordingly. In reality, whilst the family were rewarded with numerous high offices in northern England and Wales, these positions brought with them expensive liabilities. In Wales the rebellion of Owain Glyndŵr had started in September 1400 requiring intervention by the Earl's son, Sir Henry 'Hotspur' Percy. The Scots also sought to exploit the perceived weakness of the new English regime and made numerous incursions requiring the Earl of Northumberland to engage them in the Battle of Homildon Hill (1402). Whilst the latter was a clear victory for the Percy family, it was a financially costly one. The Percys demanded payment of £20,000 for debts owed by the Crown which was quite beyond the stretched exchequer of Henry IV. The situation was compounded when the King refused the Percys the right to ransom their prisoners captured at Homildon Hill, instead wishing to keep them as hostages to ensure long term security in the north. The financial situation wasn't the sole reason that pushed the Percys into revolt. During his short reign, Henry IV had already promoted their rival in the north - Ralph Neville, Earl of Westmoreland. Furthermore, in December 1402 the Mortimer family changed sides and joined the rebellion of Owain Glyndŵr in the hope of overthrowing Henry IV. The young Edmund Mortimer, Earl of March had a strong claim to the throne as he was descended from Edward III's second male child - unlike Henry IV whose father was the third eldest. As Sir Henry 'Hotspur' Percy was married to Elizabeth Mortimer, there were immediate conflicting loyalties. As the reign of Henry IV wasn't working out as they hoped, the Percys saw the benefits in another regime change. In the first week of July 1403, the Percy family released a manifesto declaring that Henry IV had seized the throne illegally and that their earlier support for him had merely been to ensure his Earldom of Lancaster was restored. Sir Henry 'Hotspur' Percy occupied Chester on 9 July 1403, publicly proclaimed "King Richard is alive!" and started raising an army. The King immediately ordered his Sheriffs to start mobilising forces and the Earl of Stafford was summoned to join him. 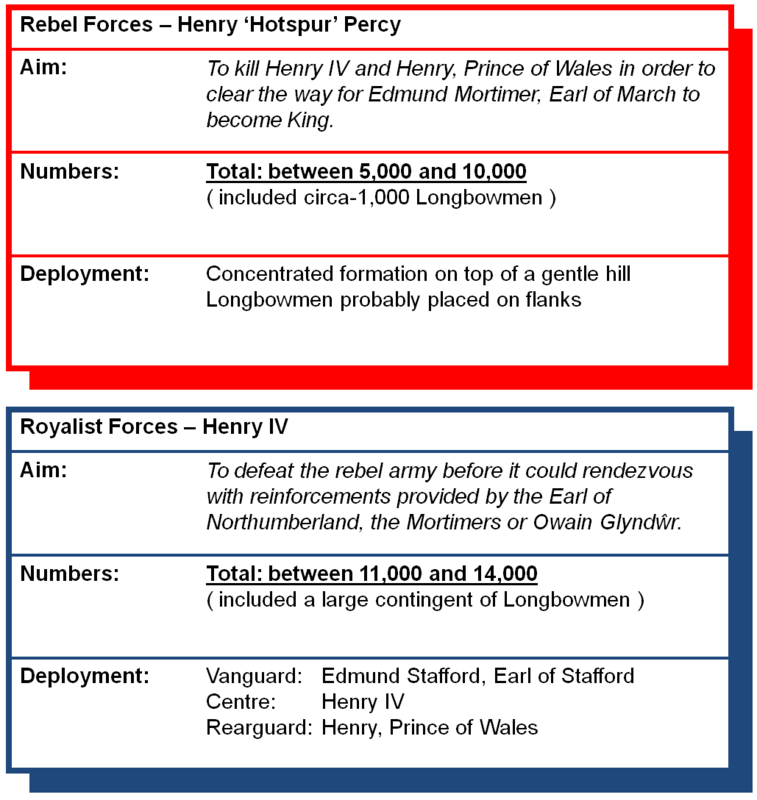 Henry sought an early engagement with Percy aiming to destroy the rebel army before it could be augmented with additional forces provided by Glyndŵr and/or Mortimer. This was indeed what Percy was planning and, having recruited his army, he was making for Shrewsbury and from there planned to move west into Wales to rendezvous with Glyndŵr. However, the town was held by Henry, Prince of Wales who barred access to the rebels and, when Percy arrived outside its gates on 20 July 1403, he was denied entry. 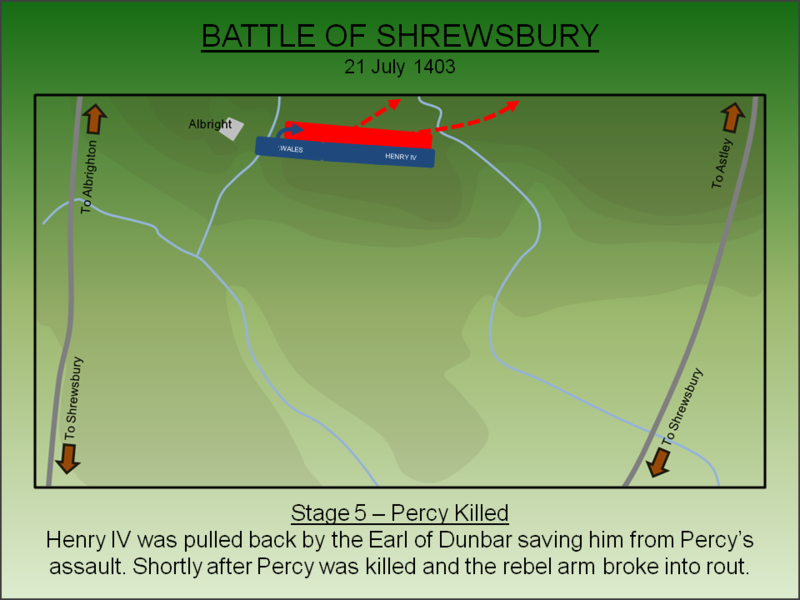 Percy withdrew north and camped his army on Berwick Field just two miles north of Shrewsbury. Meanwhile Henry IV approached with the Royal army and camped near Haughmond Abbey to the east of town. The rebel army was under the command of Sir Henry 'Hotspur' Percy, an experienced soldier who had extensive experience fighting in the border skirmishes including engagements at Otterburn and Homildon Hill. Under him were some equally experienced commanders including Archibald Douglas, Earl of Douglas who had formerly been his enemy at Homildon Hill. Percy's uncle - Thomas Percy, Earl of Worcester - also formed part of the army. Estimates of the size of the rebel force vary considerably but the overall number was significantly smaller than he had expected as he had not yet rendezvoused with Owain Glyndŵr. Accordingly his army was smaller than the King's and numbered between 5,000 to 10,000 strong. Most were untrained and inexperienced levies but the force did include around 1,000 Cheshire Longbowmen. The Royal army was under the overall command of Henry IV. The army was split into three battalions with the vanguard under Edmund Stafford, Earl of Stafford. The King commanded the main body and was advised by George Dunbar (later Earl of March). The rearguard was under the command of the sixteen year old Henry, Prince of Wales in what was to be his first major battle. A large portion of the Royalist army were longbowmen. The battle was fought on the afternoon of 21 July 1403. Fearful that his raw levies would break under pressure and knowing his strength lay in his longbowmen, Percy deployed his men on an east-west ridge overlooking a long downhill slope. The ground had been sown with peas and Percy's men tied their stems together to trip up horses and men. The slope was also peppered with hedges and ponds. Collectively Percy hoped these obstacles would slow any advance and give his longbowmen more time to inflict casualties on the attackers. 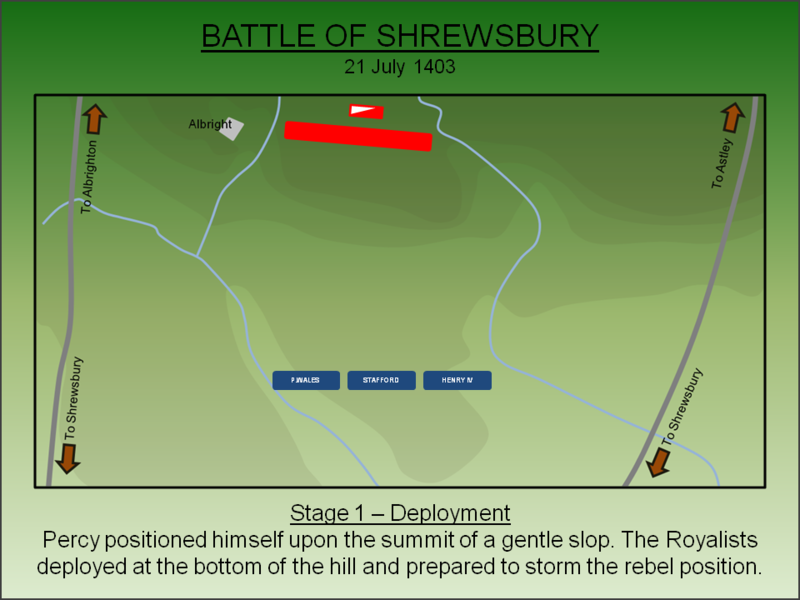 Meanwhile, the Royal army marched south from Haughmond along the Shrewsbury road and took up position at the foot of the slope. The strength of the rebel deployment was not lost on Henry IV but the requirement to defeat the rebellion was paramount and the Royalists deployed ready for an uphill slog. Given the terrain, the King was keen to avoid a fight and sent the Abbots of Shrewsbury Abbey and Haughmond Abbey to open negotiations. Percy refused to go himself but sent Thomas Percy, Earl of Worcester in his place. Accounts vary as to what was discussed but ultimately the two sides could not be reconciled. With diplomacy having failed, the King ordered the vanguard to advance. 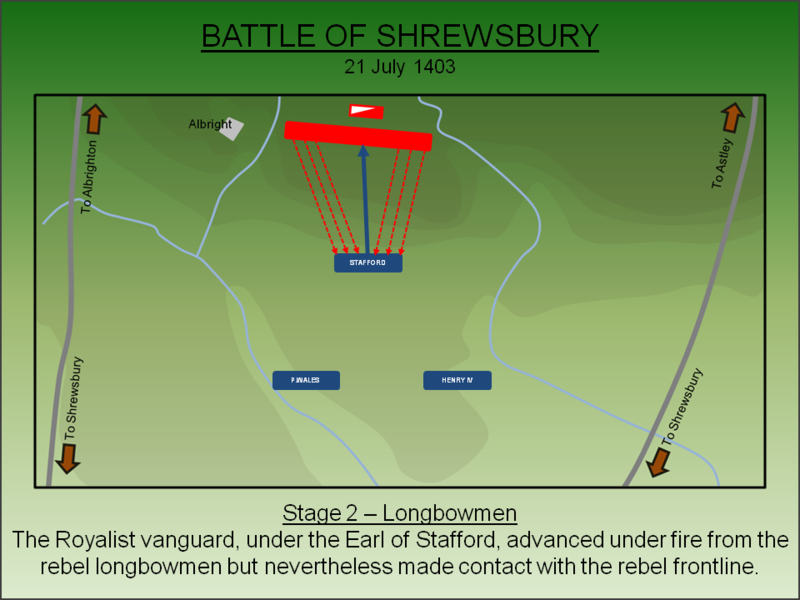 Led by Edmund Stafford, Earl of Stafford, this force of predominantly longbowmen began ascending the gentle slope towards the rebel position. Their task was unenviable as few would have been unaware that all the advantages lay with the defenders. Not only were Percy's men entrenched and equipped with shields but their elevation meant their longbows had a range advantage over those of the attackers. Nevertheless Stafford valiantly led his men forward. Percy's men opened fire as soon as they were in range. In his contemporary account of the battle, Thomas Walsingham commented that "the King's men fell as fast as leaves fall in Autumn after the hoar frost". This pretty description belies the sheer horror that the Royalist vanguard suffered as they were cut to pieces. 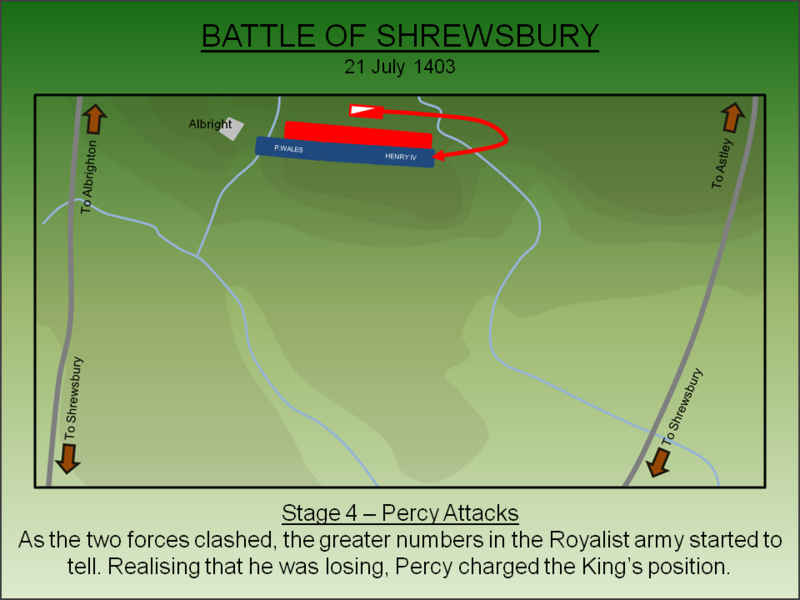 Nevertheless, Stafford led his men on through the slaughter and, as Percy's longbowmen started to run out of arrows, the vanguard made contact with the rebel front line. As fierce fighting erupted between the Royal vanguard and the rebels, Stafford was killed possibly at the hand of the Earl of Douglas. With their leader dead and their numbers seriously depleted, the vanguard broke into rout and started retreating down the hill. Percy's longbowmen followed and desperately started gathering their arrows from the corpses of the vanguard. Witnessing the carnage and realising he needed to act before Percy's longbowmen were re-armed, the King now gave the order for a general advance. The armies clashed with bitter fighting between the two factions. For the rebels the aim was to kill Henry IV and his son leading to intense fighting around their banners. Prudently the King had dressed several Knights in his livery. On the west side of the battlefield the Prince of Wales was struck by arrow in the face yet refused to leave the field and fought on. Eventually, as the battle progressed, the greater numbers in the King's army started to tell especially as Percy's longbowmen were now a spent force. He now staked everything on a charge against the King's banner. He mustered his mounted men, including the Earls of Douglas and Worcester, then charged the King's banner. However, the danger had been anticipated by the Earl of Dunbar who pulled a reluctant Henry IV back behind his lines to safety. It was prudent move for Percy's charge did reach the King's former position where his standard-bearer, Sir Walter Blount, was cut down. With the King safe, Percy's mounted cohort was overwhelmed, de-horsed and killed. Precisely how Percy died is unclear with one account suggesting that, whilst sweltering in the Summer sun, he lifted his visor for fresh air and was hit by an arrow in the mouth. Alternatively he may simply have been cut down by the men-at-arms that had surrounded him. Concurrently Prince Henry seized the opportunity afforded by the rebel charge and wheeled his force around to attack the rebel flank. This action, coupled with the death of Percy, resulted in the rebel army breaking into rout and fleeing the field. Shrewsbury was a bitter foretaste of the future Wars of the Roses. With no ransoms to be collected, the aftermath was brutal with those rebels who failed to escape were simply slaughtered. Perhaps as many as 1,600 men perished during and after the battle. Percy himself was dead whilst the Earls of Douglas and Worcester were prisoners. Whilst the former was pardoned, Worcester was executed for treason. The body of Hotspur was put on display in Shrewsbury before being beheaded and quartered. However, Henry IV was lenient to the Earl of Northumberland who was not attained at this time (although he was in 1405 following a further rebellion). Although not generally appreciated as an important battle, the decisive action taken by Henry IV to defeat Percy was instrumental in ensuring that the country did not descend into a dynastic struggle at that time. Whilst the entirety of the remainder of Henry's reign would be marred by revolt in Wales and troubles elsewhere, he retained his Crown and left his son, by then an experienced military commander in his own right, a stable political situation that subsequently endured for half a century. Henry V exploited this to the full and resumed the war with France. Brereton, G (1968). Froissart, J: Chronicles. Penguin, London. English Heritage (1995). Battlefield Report: Shrewsbury (1403). Lancaster, J.H.D (2015). Shrewbsury: Battlefield visit notes and observations. CastlesFortsBattles.co.uk. McKisack, M (1959). The Fourteenth Century 1307-1399. Oxford History of England, Oxford. Ordnance Survey (2015). Shrewsbury. 1:1250. Southampton. Stow, G.B (1977) (Editor). Historia Vitae et Regni Ricardi Secundo. University of Pennsylvania Press. The battlefield remains largely undeveloped although it has changed significantly since the fifteenth century. Then it was largely open but boggy fields in which crops of peas were grown but today it is fully enclosed. 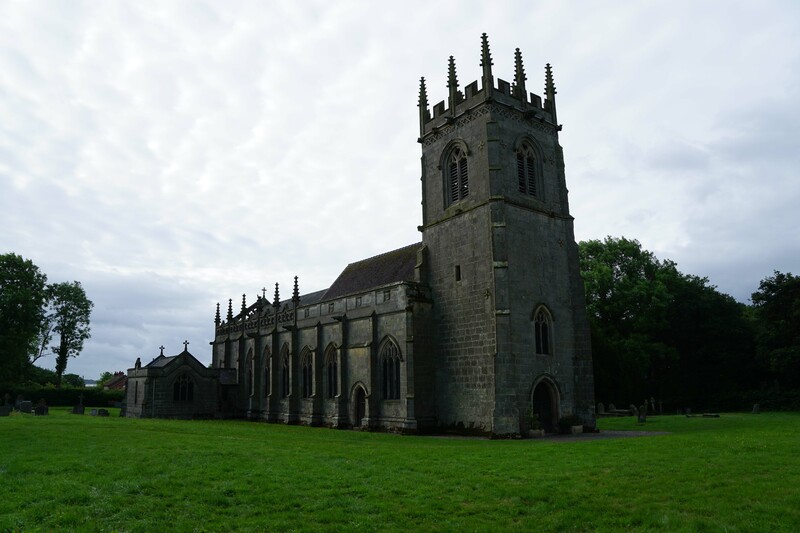 Whilst there is no monument, St Mary's Church was constructed shortly after the battle at the behest of Henry IV. A series of public rights of way allow good access to the main areas of the fighting. Battlefield Walk. 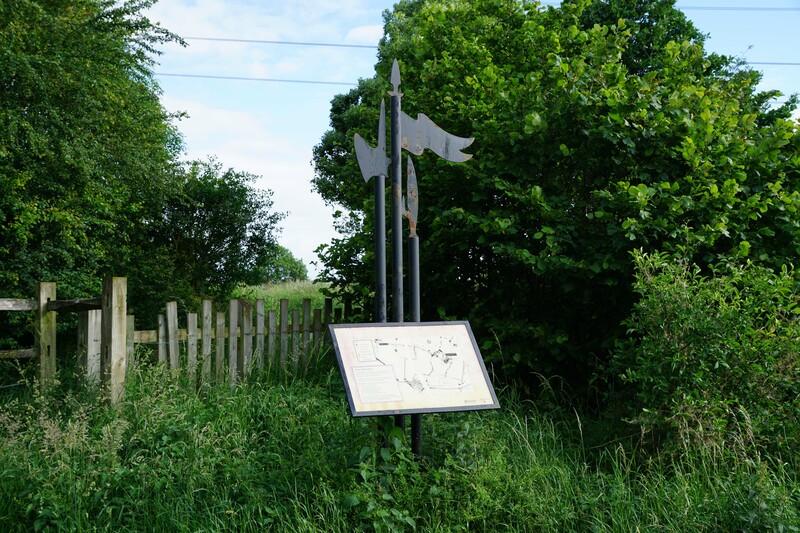 The various rights of way that cross the battlefield are sign-posted from the car park. St Mary's Church. There is no battlefield monument but shortly after the engagement, Henry IV ordered St Mary's church to be built to atone for the violence. Rebel Position. The view from near the Royalist starting position. The rebels deployed on the high ground in the distance. St Mary's church can be seen on the right and this marked the extreme left flank of the rebel position. Rebel Position. The view on the climb to the summit. It was in these fields, which then hosted crops of peas, that the Earl of Stafford's men suffered extensive casualties. Royalist Position. 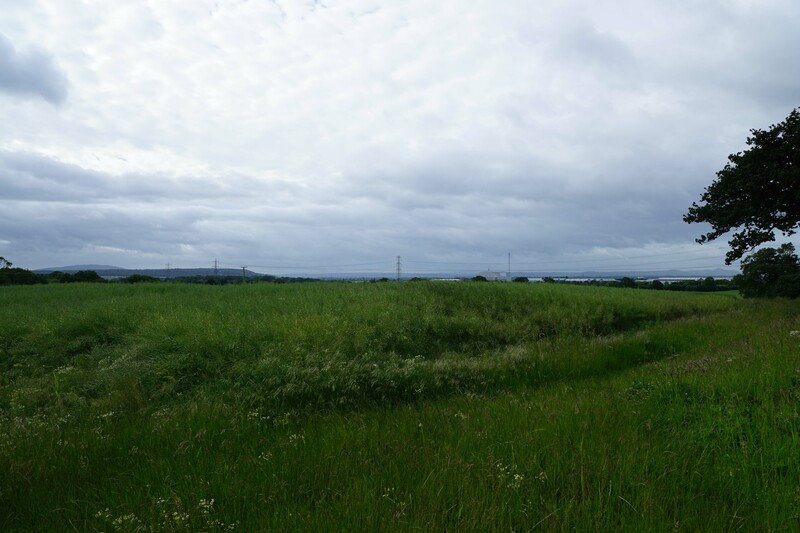 The view towards the Royalist position from the rebel lines. Mortimer Claim to the Throne. 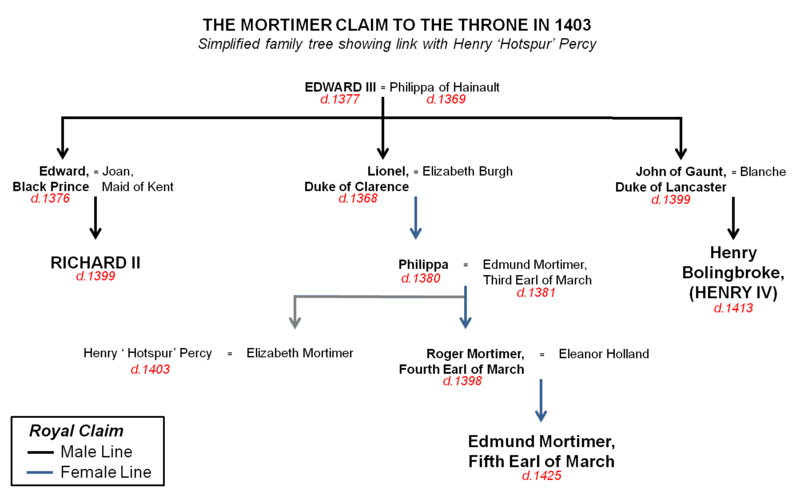 The Percys were related to the Mortimer family by marriage. This was one of their key reasons for opposing Henry IV. The battlefield is found to the north of Shrewsbury directly off the A5124. There is a large car park with access to all the public rights of way that cross the area where the action was fought.